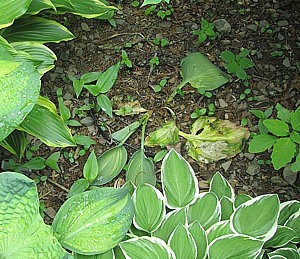 Probably the worst hosta problem of all is bacterial soft rot - the nuclear weapon of hosta diseases. Caused by a soil-borne bacteria called Erwinia, it strikes with devastating speed once the soil has warmed and continues to be a problem until the soil has dried out in summer. Even a giant clump can be killed in a week, with all the below- ground parts turned to fishy-smelling soft mush. The first sign of trouble in spring is shoots that stop developing, and by then it's too late. Later in the season divisions just start dying. Sometimes only part of the plant is hit and the rest can be saved, but immediate action is necessary as it moves through the plant very quickly. In the Garden: At the first sign of trouble dig and clean any remaining parts that seem healthy and dry them well in the sun. The bacteria need moisture to survive. Dipping or spraying with Phyton will also help the plant, but nothing can be done about it in the soil. In the Nursery: If Erwinia is present in the nursery it can't be eliminated. Dry any cut surfaces, and spray or dip with Phyton. Dusting with agricultural streptomycin is also effective. Do not wrap roots with wet paper and plastic. A warm humid environment in the box makes for perfect conditions for Erwinia, so ship plants dry.